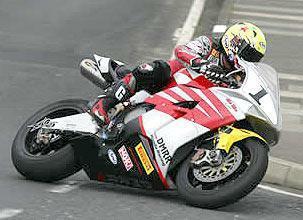 Ian Lougher and Guy Martin were among the winners at the Scarborough Gold Cup event on September 17 and 18, 2005. With 24 races taking place it was a packed weekend at the Olivers Mount circuit, for the 55th running of the Steve Henshaw International Gold Cup Road Races. The first of the actual races was the 125 Stu Reed Trophy, which also included 400cc National machines. It was won by Chris Palmer, followed by Ian Lougher and Nigel Beattie. Later on Saturday came the first leg of the Superbike class, with Ian Hutchinson taking the win from Ian Lougher and Jason Griffiths, following a restart after a red flag incident. The 250c Lee Pullan Trophy saw the first win of the weekend for Ian Lougher, with Chris Palmer and Nigel Beattie filling the podium. Lougher was agains successful in the first leg of the David Jefferies trophy for 600cc sports bikes. Mick Goodings and John McGuinness took second and third. Sunday saw Ian Lougher take another chequered flag in the second leg of the David Jefferies Trophy, from Guy Martin and John McGuinness. The second leg of the National Superbike race saw Guy Martin take victory from Ian Hutchinson and Ian Lougher. The second leg of the Stu Reed Trophy went to Lougher, from Palmer and Peter Wakefield. Lougher and Palmer also took first and second in the Phil Mellor 250 trophy race. And it was Guy Martin who triumphed in the feature race of the weekend, the 12-lap Steve Henshaw International Gold Cup. Martin led from the start but the race had to be red-flagged on the opening lap due to Adrian Archibald crashing out, unhurt. The restart saw John McGuinness lead, but by the end of the first lap, Ian Lougher led from Hutchinson, Martin, McGuinness, Palmer and David Bell. By lap five Martin moved into the lead, and was able to hold it to make history by becoming the second man to win three Gold Cups in a row. Discovered MCN Auctions? Click here.